Hamantaschen cookies are a traditional Purim food. On Purim I also make a dish to specifically honor Queen Esther. Because traditional Hamantaschen is heavy and too sweet, I created healthier plant-based recipe version that uses just the tiniest amount of oil (here is why I only used a little tiniest bit), less sugar, and a high protein filling inspired by my last 6 years living in Asia end enjoying Cambodian dessert. In Cambodia where I live, desserts sometimes include beans and bean purees. I have come to love the taste of beans in sweet desserts. This inspired me to create a bean-based high-protein brownie hamantaschen filling. Across Asia, beans in sweet foods are common, and I have come to love the combination. Beans are included in coconut milk popsicles, in tapioca puddings, in rice cakes, and so on. Beans are filled with fiber and low in fat, and they increase the nutritional value of any dish, including desserts. My first contact of beans in sweets was bean puree inside vegan mooncakes — round pastries that are filled with sweet bean paste, a delicacy commonly served throughout Asia during the Mid-Autumn Festival. These delicious treats are have become an annual highlight for me. 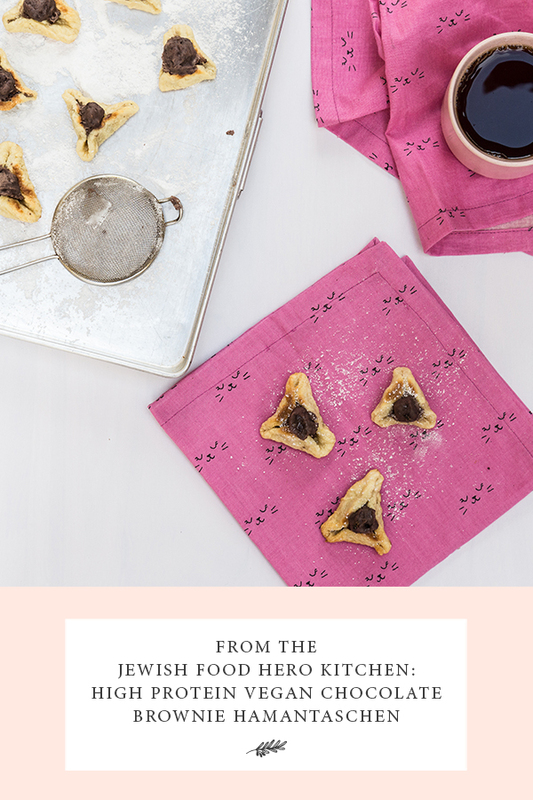 Inspired, I wanted to “borrow” this idea and add beans to hamantaschen, the triangle-shaped cookies that Jews typically eat on Purim, which this year begins on the evening of February 28. For me, eating hamantaschen is often followed, a few hours later, by an steep energy drop and sugar-induced grumpiness. By swapping the typically fillings — such as apricot jam or sweet poppy-seed paste — with a bean-filled one, I figured I could up the amount of protein and therefore balance the super-sweet cookie. The chocolate-black bean filling is the highlight in these plant-based, high-protein hamantaschen. You might find yourself eating the filling by the spoonful so you might want to make a double batch and eat it with toast for breakfast or an afternoon snack. It sort of feels and tastes like a healthy Nutella. When I posted this recipe onto Jewish Food Hero’s Instagram feed. Combine the arrowroot flour and the milk. Mix well with a fork or small whisk until smooth. • In a large bowl, cream the coconut oil and sugar together with the orange zest. You can do so by hand or with an electric mixer. • Add the dry mixture to the wet, and stir to combine. Be careful to not overmix.